The mobile homes for sale at Cypress Lakes are truly a step above those in many other 55+ communities in Central Florida, but are surprisingly affordable. 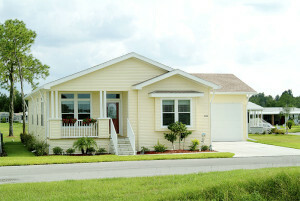 We offer both new and pre-owned manufactured homes, many of which have been refurbished and are ready for occupancy. At Cypress Lakes, you won’t have to sacrifice quality for the sake of affordability. But, at Cypress Lakes, we like to say that we offer more than a place to live – we offer a lifestyle. Our homes are all situated among 1,000-plus acres of lush natural foliage, including beautiful cypress trees. There are several sparkling lakes throughout the development, which are stocked and are the perfect setting for those who love to fish. Those lakes also provide formidable challenges for golfers who enjoy our two professionally designed courses – an extraordinary amenity for those who choose Cypress Lakes as their home. We even provide a fully stocked pro shop that is staffed by a PGA pro who can answer questions and is available for individual or group lessons. In addition to all this, we have an updated clubhouse with two heated resort-style pools, one with zero-depth entry. There are daily activities, a state-of-the-art fitness center, and many other amenities that will make you glad that you chose Cypress Lakes for your new home. If you’re interested in learning more about our mobile homes for sale, or would like to schedule a tour of our amazing community in Central FL, contact one of the friendly Lifestyle Consultants at Cypress Lakes today.